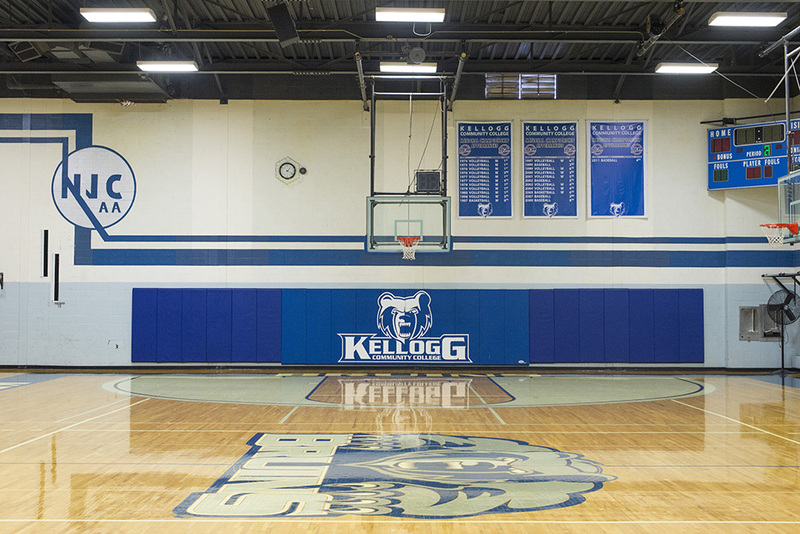 After 50 years of operation, Kellogg Community College has closed its storied Miller Physical Education Building, which will be demolished and replaced. The building, which was built in 1966 and has been home to the College’s physical education classes and athletics home games, is to be removed starting in early January to make way for a new facility scheduled to open in the fall of 2018. KCC President Mark O’Connell said a new building will better serve the needs of the College’s students and the community in general. As of Dec. 13, all home KCC athletics events that would have otherwise been held at the Miller Building will be held at the Battle Creek Central Fieldhouse, 162 Champion St., Battle Creek. Beginning with KCC’s Spring 2017 semester, which begins Jan. 13, select physical education classes will be held at the Battle Creek YMCA Multi-Sports Center, 182 Capital Ave. NE, Battle Creek. The YMCA partnership will also include aerobics and weight room space in the Multi-Sports Center, allowing for free open workout time for KCC students when classes aren’t in session. Additionally, KCC students taking nine or more credit hours will have the opportunity to sign up for a YMCA membership for a reduced rate of $10 per month – half the cost of a regular student membership. Over the past several decades, the Miller Building has become outdated and inefficient. After reviewing multiple design options, KCC determined earlier this year that replacing the building entirely would be the most cost-effective step forward. KCC will pay for the estimated $10 million project with revenue from a voter-approved capital millage and other grants. Construction on the new facility, which will be built in the same location as the current Miller Building, is expected to run from May 2017 through May 2018, with regular operations resuming onsite by the Fall 2018 semester. Tom Shaw, director of KCC Athletics and Physical Education, said the new building will have dedicated space for physical education curriculum, a bigger weight and workout room, a bigger gymnasium, dedicated space for KCC Police Academy fitness training, more efficient heating and cooling systems and other modern amenities.